C-FMAX outside the Museum hangar at Winnipeg - CYWG, Manitoba. • CF-MAX Re regd to Manitoba Government Department of Mines & Natural Resources, Winnipeg, MB. Date unknown. • CF-MAX Re regd to Province of Manitoba Air Division. Winnipeg, MB. Date unknown. • C-FMAX Re regd Province of Manitoba Air Services. Winnipeg, MB. 05-Nov-1990. Power plant. Converted to Vazar PT-6 turbine by Viking Air, Victoria, BC. Apr-2005. 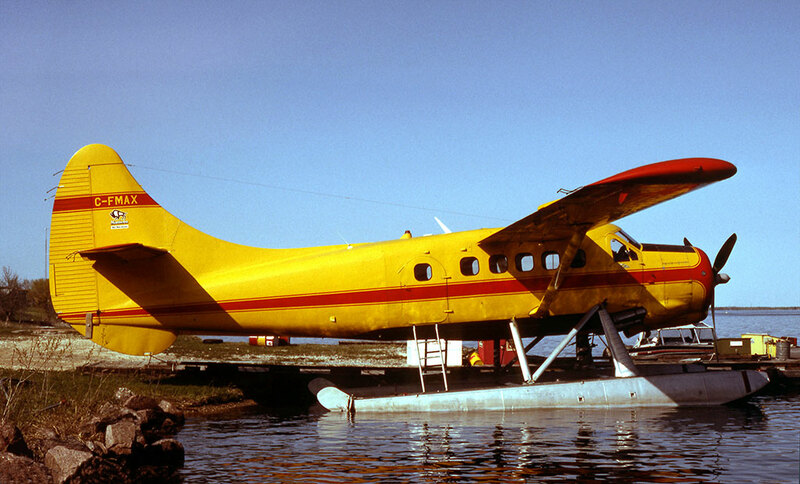 Otter 267 was delivered to the Manitoba Government Air Service on 4th June 1958, registered CF-MAX. It was delivered as a floatplane, and joined Otter CF-MAU (74) which had been delivered in February 1956. The operation of the Manitoba Government Otters had already been described in relation to number 74. MAX also underwent the same changes of registered owner, to Manitoba Government Department of Mines& Natural Resources; later Province of Manitoba Air Division and most recently, Province of Manitoba Air Services, the registration becoming C-FMAX. A few incidents have been recorded, relatively minor ones given this Otter's long service in the bush. On 15th May 1973 at Riverton, Manitoba, as the accident report summarised: “Unfavourable wind conditions; dragged wing tip of float; substantial damage”. On 18th August 1989 at Wasagomach, Manitoba, after dropping water on a forest fire, the Otter struck a tree but with only minor damage. On 2nd April 1990 at Burnwood River, Manitoba on approach to Thicket Portage, the engine quit. The Otter landed without any damage. The Otter was still in service with the Manitoba government during 2004. 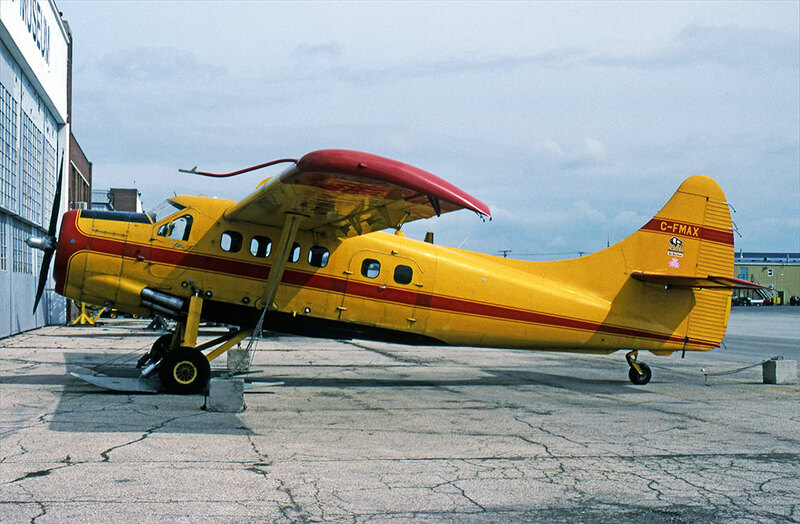 The Province of Manitoba Air Services arranged for two of its Otters to be converted to Vazar turbines, with the PT-6 engine. The aircraft in question, CFMAX (267) and C-FODY (429) routed Winnipeg to Calgary on 30th March 2005 and then onwards via Golden, BC., to Vancouver where they arrived on 2nd April. ODY entered the Aeroflite Industries hangar at the Vancouver International Airport where the conversion work was performed. MAX was converted by Viking Air at Victoria, BC., and was the first to be completed and passed through Calgary at the end of May 2005 on its way back to Winnipeg. The following month, June 2005, both MAX and ODY were flown to Wipaire at Minneapolis, Minnesota where they were fitted with Wipaire 8000 amphibious floats, before returning to Winnipeg. In January 2006 both Otters were flown to Rocky Mountain Aircraft at Springbank, near Calgary, Alberta for a new avionics fit, then in April to Red Deer, Alberta for repainting into a new red and white colour scheme, then back to Springbank for finishing off and return to Winnipeg end April, in time for the summer 2006 season. These two Otters are the very last Otters still in government service in Canada, and as they have now been updated with turbine engines and state of the art avionics, they are set for many more years of government service. Both Otters were noted at the Lac du Bonnet summer base in mid May 2006, undertaking training in advance of a busy operational summer season.